PRODUCT DESCRIPTION: Light product with the consistency of Talc Powder which is applied over plants, vegetables, fruit and any part of a plant, shrub or tree you want to save from chewing and feeding tent caterpillars and other insects. Once treated, there will be a light dust over the treated areas. This dust will provide protection from targeted pests and will not hurt the plant. Also labeled for use on dogs and cats to control fleas, ticks and lice. WHERE TO USE IT: On any plant, flower, fruit, vegetable, tree, shrub or other vegetation you want to protect. Apply it directly to all parts needing protection. Also for use on dogs, cats, swine, horses, poultry and cattle. RATE OF APPLICATION: Just enough to get a light film over treated areas. Apply weekly or as needed. This product has 7-14 days to harvest so take that into consideration when treating vegetables and fruit. RELATED PRODUCTS FOR PEOPLE: FLEA REPELLENT (aerosol spray) FLEA BITE OINTMENT (for people and pets). RELATED PRODUCTS FOR THE PET: FLEA COMB OXY MED ITCH RELIEF SPRAY MELALEUCA SHAMPOO WATER BASED (GENTLE) PERMETHRIN PET SPRAY PETCOR (alcohol based – strongest pet spray available – KILLS FLEA EGGS!!) TRIPLE PYRETHRIN PET SHAMPOO (great smelling and very effective) FLEA DIP CONCENTRATE. Can I use this on my double knockout roses? If I buy the Permethrin Dust, how do I apply it? Do I dust it all over the rose bushes? This would be a good product for use on roses. 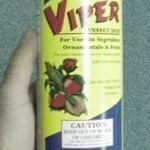 It will control a wide range of pests and is easier to apply compared to a spray. Plus it won't "burn" the bush which can happen during the hot summer months. Remember, it doesn't take much dust to do the job. But if you have more than 5-8 bushes, a Dustin Mizer might be the way to go. It will treat 20-30 bushes in less time than it would take to use the hand duster on 5 bushes.